If you have been charged violating the terms of your protective order in the Dallas / Fort Worth metroplex, you could face harsh repercussions, including jail or prison time, steep fines, and/or additional criminal charges. A protective order, restraining order, or order of protection is generally issued by the court to prevent an individual from committing certain acts or engaging in certain types of behavior. Protective orders are usually most common in cases of domestic violence or family violence, and are generally ordered after a judge has determined some kind of family or dating violence has occurred and will likely happen in the future. If you have been accused of violating the terms of your protective order, it is important to contact an experienced Dallas criminal defense lawyer as soon as possible to begin working on your best legal defense. If you have been charged with violating the terms of a protective order in Dallas, or any of the surrounding areas in Texas, including Garland, Irving, Grand Prairie, Denton, Plano, McKinney, Fort Worth, Rockwall, Johnson, Wise, Ellis, Arlington, Mesquite, Carrolton, Richardson, Lewisville or Frisco, contact Law Offices of Richard C. McConathy. Attorney Richard McConathy is an aggressive family violence lawyer who will make every effort to fight the allegations against you. Call Law Offices of Richard C. McConathy for a free consultation at (972) 233-5700 about your alleged protective order violation. Family Violence – Family violence involves an intentional act by one family member against another that causes physical harm or bodily injury. This is also known as domestic violence, domestic abuse or dating violence. Dating Violence – Dating violence involves an intentional act by one person against another person they are currently or previously in a dating relationship with that causes physical or bodily harm. Family Member – A family member is anyone related by blood, marriage, a former marriage, foster parent, parents of the same child or step-parent. Household Member – A household member is anyone who resides or has previously resided in the same home, such as roommates. Petitioner – A petitioner is also known as the complainant or applicant, and is the individual who requests the protective order, or the protected individual. Respondent – A respondent is also known as the defendant, and is the individual who the protective order was put in place against, or the individual who is the alleged offender. Goes to or near any school or child care facility where a protected child resides or attends. Pay financial support to the petitioner or other family or household members. An individual who has been charged with violating the terms of their protective order can face a class A misdemeanor conviction, which is punishable by up to one year in jail and/or a fine not more than $4,000. An individual who has been charged with violating the terms of their protective order can instead face a felony of the third degree conviction if they have two or more protective order violation convictions or they violate the protective order by committing a stalking or assault offense. This degree of offense is punishable by a prison sentence ranging from two to ten years and/or a fine up to $10,000. Additionally, a protective order violation can negatively impact admission to college or graduate school programs, future occupations or jobs, scholarship applications, certain types of financial aid, and applications for public housing. What Happens After You Violate a Protective Order? If you are found to be in violation of a protective order, you will be arrested and booked into jail. From there, you’ll appear before a judge at a bail hearing. The judge will review the facts and determine if they believe you did violate the protective order. If the judge finds the evidence doesn’t support the charge, you’ll be released. If the charge sticks, you’ll be detained into jail while you await trial. You’ll be sentenced after your case is heard at trial. Depending on the gravity of your charges, it may be possible to negotiate probation rather than jail time for you. Your protective order will probably remain in place after you serve your sentence. On top of your term of imprisonment and financial penalties, your gun rights will be suspended. You will be barred from owning or possessing a firearm for five years after you’ve completed your sentence. If you’ve been accused of violating your protective order, it’s in your best interest to contact the Law Offices of Richard C. McConathy. Contact Law Offices of Richard C. McConathy today for a consultation about your alleged protective order violation throughout Dallas County in Texas. 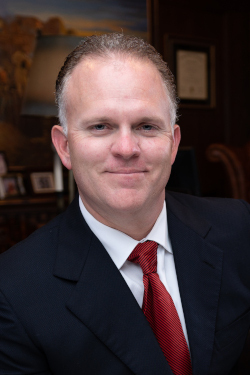 Richard McConathy is an experienced Dallas criminal defense attorney who will make every effort to fight the allegations against you and help you avoid the harshest penalties and repercussions to your alleged offense. Contact Law Offices of Richard C. McConathy at (972) 233-5700 for a consultation about your alleged violation of a protective order throughout Dallas County in Texas and the surrounding counties of Denton County, Collin County and Tarrant County.